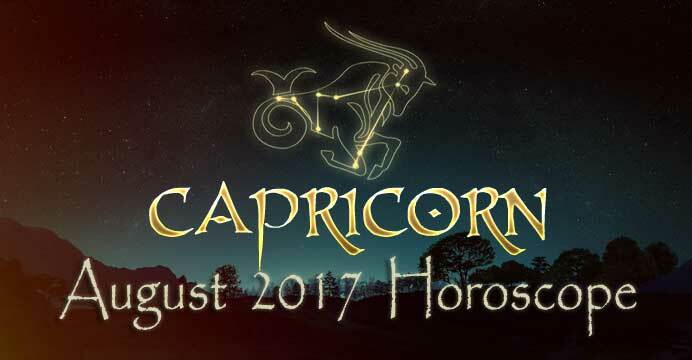 Capricorn August 2017 Horoscope | Capricorn Life - Capricorns Rock! 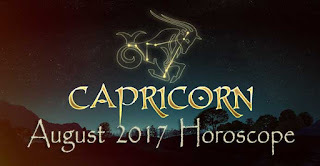 Capricorn is a sign known to be careful and wise when handling money, so this month, with financial topics dominating the messages of both eclipses due August 7 and 21, you will be confident and in control. You can now get a good grip on financial affairs and with some effort, see your savings grow to their maximum potential. There are many reasons you may be focused on money, and I will offer examples of those. There are two eclipses due this month, for they always come in pairs. Eclipses are very powerful and their mission is to help you get closure on important actions and decisions, and to move you forward on a matter of vital importance. The first will be a lunar eclipse, a full moon, August 7 in Aquarius, 15 degrees. It will light your second house of earned income, savings, and possessions. This same house also rules money you owe others, and you may be writing a large check at this time for an obligation you made that you knew was coming up. Money seems to come in, too, and I feel you will be pleased by the generous amount you see – this eclipse will be ideally angled to Jupiter, the giver of gifts and luck. Jupiter has a long, storied history of bringing generous financial bounty, but keep in mind, the money you see won’t be money you win, but money you earn. No need to go to private rooms for poker – you will receive this money as compensation. You might be negotiating salary for an important new job or purchasing an expensive but valuable item, such as a house, paying for a renovation, sending in tuition for college, or taking an awe-inspiring trip you saved to take, for doing so is so important to you – you get the idea. Full moon eclipses conclude things, so within five days of August 7, you will send your check(s) or find accord on a landmark deal. Jupiter will staunchly protect your interests – it appears that your rising status in your community or industry is the reason for the generous increase of cash that will be coming to you now. Starting last year, in September 2016, Jupiter entered your house of prestigious career advancement, and Jupiter will leave in October 2017. Before Jupiter does leave, he will make sure you are rewarded for the hard work you have done in your chosen field over the course of many years. You have apparently proven yourself – you are fair, wise, and trustworthy leader and also are good at appropriating budgets. Jupiter is in Libra, a sign associated with the law, and you appear to have learned – or will soon learn – the important points of the law as it affects your day to day dealings. Saturn will be close enough mathematically from his perch in Sagittarius to beam his gifts of stability to you for the actions you will take at the full moon. You may see your savings grow, and you will likely feel more secure and are likely to pay off debt. Now let’s turn to another major moment of the month, the total eclipse of the Sun, due August 21 in Leo 29 degrees. This eclipse will immediately put the spotlight on money you share with another person, entity, or company. The word “share” has a lot of different meanings in astrology, from money you share with a credit card company, to funds you manage to get from a venture capitalist if you are starting a business. It is the taxes you owe to your government, mortgages, refinanced mortgage, bank loans, and money from student loans. This house also rules funds that are owed to you from an insurance company payout on your claim, or an inheritance that is being studied by the courts. Among these examples, you might be focused on one of these areas. On a simpler level, the eclipse might alternatively focus on money you hold with your spouse or your roommate, and how you handle that arrangement. If you loan money to a friend or family member, this house would cover the verbal or written agreement you made together about how you would get paid back, if you require that – large cash gifts would also be covered by your eighth house. If you are in the process of a divorce, and you are trying to find the fair division of property at the end of your marriage, or the division of profits at the end of a business partnership, you will likely open talks at the eclipse August 21. Remember, a solar eclipse is not an emotional full moon eclipse but rather an objective new moon, denoting opportunity and the start of a new chapter, not an ending. All month, be careful to check for identity theft, because with so much emphasis on money, and Mars with the Sun and new moon, you would probably be wise to double check to be sure all is well with your accounts. The eighth house also rules transformations, and as such it is the place of surgery, where the surgeon removes the part of you that is hurting you so that you can transform to health again. The need for surgery might come up, but if so, you have truly supportive aspects for this and the earlier eclipse. I have not seen any eclipses like these that are entirely supportive. I will say here that I cannot see all the aspects in your unique chart, but I can see the relationship the planets are having with other planets, and they are outstandingly positive. All eclipses bring a need for an adjustment, but I feel the ones asked of you will be fairly easy to make. On August 21, the solar eclipse, you have the Sun, new moon, and Mars in one corner of the sky, in your financial eighth house. At the same time, Uranus in Aries will be perfectly positioned in your fourth house of home and family. Also at the same time, Saturn in Sagittarius will be beaming the last side of the triangle from your twelfth house of health and all confidential matters, completing a perfect golden triangle of harmony. This is a rare and very special coincidence. If you are buying a house, or want to improve your home by having a renovation, say, of your kitchen or bathrooms, you will have the support of the banks or from family to do it. The money comes – you simply have to present a well-crafted plan. Uranus rules sudden surprises, so if you have had a goal involving your living quarters, it might be solved in the blink of an eye, quite unexpectedly. Saturn will also be on hand for this eclipse too, and offer you a chance to put your finances on solid footing. If you renovate your home, it may be to appreciate its value – all your twinkling stars are suggesting this to be true. This eclipse is so supportive of you, it is likely to be downright magical. Often when we have a lot of emphasis on the eighth house, it means a massive lifestyle change and upgrade is underway. This could describe your situation now. Let’s talk about special dates that are coming up, and all of them will be helpful to your financial situation. If you have an important presentation, negotiation, or job interview coming up, one where important financial topic and benefits will be discussed, schedule that meeting for August 10. On that day, Jupiter, the great good fortune planet and the Sun will be in ideal sync, linking your career reputation to your solar eighth house, ruling money based on performance – commissions, royalties, licensing fees, cash advance, bonus, company benefits like health care and flex time, and other such funds. This will be one of your luckiest days of the month. Secret talks about money done over Sunday, August 13 or Monday, August 14 might be quite successful, for the Sun and Saturn will be aligned perfectly, and Saturn is your ruler. More good vibes involving work and money (big-time money) will come up over the weekend of August 19-20, so it would be a good weekend to shape your resume and CV and send it in. Or, circle August 18, Friday, as a good day for your meeting – it is a day when Mars (action) and Jupiter (good fortune) will be very close. If you are having a first, confidential meeting, where money won’t be discussed, but you want to underscore your accomplishments and make a lasting positive impression, then schedule the meeting for Thursday, August 24 or Friday, August 25, when the transiting moon will be moving through your career honors (Libra), and Saturn and Jupiter will be moving toward a rare and beautiful aspect that will help you easily make a lasting impression about your outstanding contributions and victories. All month, have talks but try not to make final decisions quite yet. Mercury will be retrograde from August 12 to September 5. It is a good time to talk, but not to etch anything in stone quite yet. I feel with so many people taking the end of August as vacation time, you won’t have problems putting off the signing. I would like you to wait until September, with space from the date Mercury turns direct (September 5) to the date you sign. I would like you to consider September 15. There is another reason you should be quite cheerful in August. For months, your ruling planet, Saturn, has been in a weak retrograde orbit, and Saturn retrograde made it hard for you to be as effective as you had hoped to be. All that changes now, for Saturn will go direct on August 25 and stay strong for months – until mid-April 2018. Once Mercury goes direct in early September, you will see the difference. It will be easier for you to make faster progress. In all ways, things are looking up, dear Capricorn. In terms of love and relationships, although it won’t be the biggest month you’ve seen for romance, you will have Venus moving through your partnership / marriage house until August 26. Venus will keep your relationship interactions warm and loving if you are happy, or if you are about to break up, you can keep the ending calm, caring, and polite. In a world where everyone seems to have no ability to filter impulses, you will appreciate the kind interaction you have with your other half in love or business. This will be a major month for thinking about money, and lifestyle changes may trigger your motivation to make needed adjustments. A full moon lunar eclipse will come by on August 7 and help you finish up an important salary negotiation, or if self-employed, conclude a joint venture you may be hammering out or a project with a new client. Jupiter, a financial planet, and also the giver of gift and luck, will be in ideal position to see you get generous compensation. Speak up for your due, for you have a superb opportunity to get what you want. Jupiter is now in your house of professional honors and achievements, so you will find it easier than usual to get the attention you deserve from VIPs. The new position you take on this year should bring great opportunity and establish you as a leader in your field. Saturn, your ruling planet, will be highly supportive too to the eclipse, so you might want to find a financial advisor who can help you make your money grow while you sleep. Eclipses are powerful and have the strength of three new or full moons rolled into one. We usually long remember the actions we chose to take after an eclipse has come by. Eclipses are meant to take you out of a rut and also show you the array of choices you have, but have not been cognizant are there for you for the taking. We fail to see the possibilities that life holds for us. You had a very similar set of eclipses that are appearing now back in 1998, for eclipses repeat in exact degree every 19 years. Think back to what happened in August 1998 to see if you can discern a theme that emerged – you may get a clue of what will come up. Keep in mind, however, that the other planets were in different places, as planets are always on the move. Still, you should be able to see a common thread emerge. Mercury will be retrograde from August 12 to September 5, not a time to accept a new position, but if you need a job, and you cannot delay giving your verbal or written consent, you may have to agree to the job, and sign. It would likely be a position with power, influence, and money. The problem with taking a job when Mercury is retrograde is that the job will change in a short time, and in not the way you would like. Delay signing papers or giving your answer for at least ten days after September 5, if possible. The second eclipse, August 21, will be even friendlier than the first one August 7, if that is even possible. That is quite a statement, considering the first eclipse will be mighty supportive. The second eclipse is due in Leo on August 21. Again, money will be the topic on the table, but the type of money you will be discussing will be different. You may be applying for a mortgage, university financial aid, venture capital, bank loan, or line of credit, or you may be discussing a royalty, cash advance, or commission. On the August 21 solar eclipse, the little planets will act like little fairy godmothers that will talk to each other and cook up a plan to help you do well and on a remarkable scale. A golden triangle will appear, linking the Sun (solar eclipse) and new moon to your ruler, Saturn, bringing you stability and security, and to Uranus, planet of surprise breakthroughs, in your house of home. The position of Uranus points to luck with real estate, so if you want to sell a house, buy one, renovate, have repairs or a paint job done – no matter what your project – you can find the money to make it happen now. To be clear, your access to money won’t be limited to real estate goals. The eighth house is the part of the chart that deals with money you need – outside your savings – to make a dream possible and tangible. This is the house lit up now, and so it’s clear, a dream is within your grasp if you reach out and apply for the funds you need. Love will need to take a back seat to money dealings his month, for the universe is speaking clearly – fund that dream, and in subsequent months, everything else will click into place.